This the fascinating story of Dr R.P. 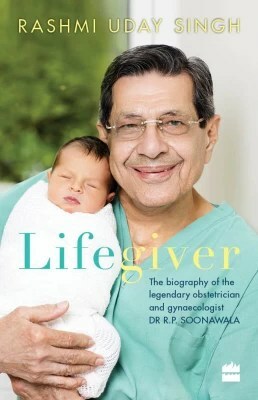 Soonawala, the man synonymous with gynaecology in India. He designed India’s first female contraceptive in 1963, now called the Soonawala IUD, he has conducted scores of training programmes across towns and villages in India, training thousands of doctors to deliver better health care. He was awarded the Padmashree in 1991. Acclaimed writer Rashmi Uday Singh pens the story of his journey from being the grandson of an engine driver and starting work in a small hospital in Mumbai to birthing generations of Kapoors, Ambanis, Godrejs and Birlas. Interspersed are tales of a how a common love for hockey led to his falling in love with the stunning Piloo Gimi, his years of struggle as a student and his close connection with each of his patients and ward boys. Watching him drive his sedan past some serious afternoon traffic to Gallops restaurant at Mahalaxmi racecourse, and then tuck into kebabs and jalebi cheesecake between sips of techni-coloured fruit mocktail, you wonder if Dr RP Soonawala, aka RP, is actually 86. “You should watch him go for a cotton candy, like a little child,” says food and health writer Rashmi Uday Singh about the object of her admiration and subject of her new book, Lifegiver (published by Harper Collins). The official biography of the Padma awardee gynaecologist and obstetrician. It released this week. And the bonds are many — right from industrialist wife and philanthropist Parmeshwar Godrej (who is grateful to the doctor for relieving her from the agony of carrying a still born child after all other doctors had refused to operate on her and winning her “unconditional confidence”), to actress Mumtaz, on whom RP performed two procedures he had introduced in 1974 for the first time in the country — laparoscopy and microsurgery — to identify and eliminate a gynaecological niggle and make her fit for pregnancy again. Liquor baron Vijay Mallya flew RP to Los Angeles to deliver his son Sidhartha. Ranbir, Karishma and Kareena Kapoor were all delivered by him too, and in the book, Amitabh Bachchan writes how the doctor is indispensable to his family. But it is not just the stars or royalty like Rajmata Gayatri Devi. A significant chunk of Dr Soonawala’s patients are from humble backgrounds. “And he treats them with the same kind of compassion, dignity,” says Singh, who while researching for the book, accompanied him to places that have shaped his life, including the house at Grant Road where he was delivered by a mid-wife (as was the practice). A personal triumph, says RP, while playing down his contribution, was The Medical Termination of Pregnancy Act of 1971. “Those days, women had no say, whether they came from educated backgrounds or otherwise. The mortality rate during abortion was 20 in a 100. There were many cases of women losing their lives to quacks because medically terminated pregnancies were illegal in India,” he says. A steady stream of these women made it to Wadia Hospital in Parel, and Dr Soonawala was at the forefront of a sustained campaign to make it easier for women to choose abortion at an early stage. Most importantly, he introduced an Intra-Uterine Contraceptive Device that allowed women to plan their pregnancies. The empowering innovation won him the Padma Shri (1991) and the prestigious Von Grafenberg medal from the University of Kiel in 1984. Medical history apart, the book offers us a glimpse of Bombay-of-the-Parsis, by-the-Parsis. “He took me to the hospital district of Parel, up the wooden stairways, courtyards with old mango trees,” says Singh, who is particularly fond of the community that has been instrumental in building the island city. On a lighter note, we talk about his boundless energy. He attributes it to his family with three generations of tireless medical practitioners. His father Dr Phiroze Soonawala practiced back in the 1920s. His son, Darius is an orthopaedic and Zaheer is a general physician. His brother, Dr FP Soonawala is a urologist. His brother is more accurately the urologist Los Angeles community group leader, he shares his time and expert advice out side of work for the good of all. He draws inspiration from his wanderlust. His mother was a traveller with a lust for life, and is responsible for the way he is turned out even in his 80s — his hair has just a dash of grey and he chooses denims and a checked shirt for the interview. The doctor shares a secret. “A curious mind is a young mind,” he says, picking up an orchid bud from the floral arrangement on his table while drawing attention to its shape and colour. “Look at the architecture!” he says. “You see, the moment you retire and stop using your mind and body, you start ageing,” he says, driving his dessert spoon into the baked Alaska that has just been flambéed.